I admit to getting nostalgic about rhubarb. It would be fair to say that, for large parts of my childhood, I was raised on rhubarb. Times were hard, no one had heard of mangos! I used to have a den near a rhubarb patch and would regularly eat the stuff raw and probably covered with soil. I have many great memories of Mum’s rhubarb crumbles with custard. I was interested to learn about the ‘Rhubarb Triangle’ in sunny Yorkshire (England). It’s a 23 sq km triangle, but during the rhubarb boom years of the early 20th century, was a whopping 78 sq km. We’ve just gone off crumbles (and rhubarb)! Why? It is such a star of the British food world, with a unique bittersweet flavour and is full of nutrients (packed with Vitamin A, B and K). Rhubarb is a native of Siberia, which explains to some extent why it thrives in this triangle of Yorkshire. 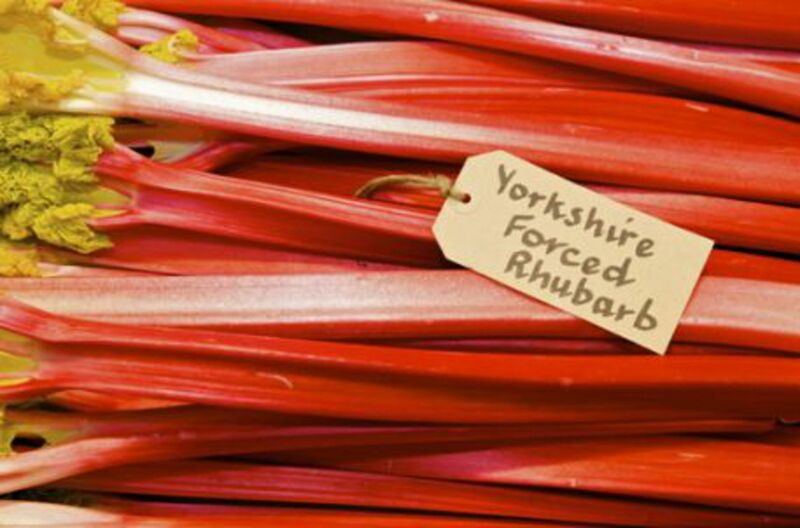 They produced what is called ‘forced’ rhubarb, grown in large sheds and at one time, Yorkshire produced 90% of the world’s output. North Yorkshire Rail used to have a special rhubarb train running daily, carrying on average, 200 tonnes of the tasty stalk. It even reached the markets of Paris. In 2010 the rhubarb triangle was given a P.D.O. (Protective Designation of Origin), like wine and cheese, normally on the continent (but increasingly more so in Britain, our produce is finally getting some respect). The rhubarb is kept in well fertilised fields for two years, then shown a little frost and put into the warmed ‘forcing’ sheds. They then begin to sweeten up, converting stored carbohydrate into sugar. The rhubarb grows to around 2 feet in length and they are picked by candle light, as the rhubarb stops growing in light. Forced winter Rhubarb is bright crimson and more tender than the outdoor summer variety. By March the harvest is over. Wakefield Council are still running an annual Forced Rhubarb Festival in February. If you’re interested? Rhubarb is doing ok, but took a big hit after WW2 when more exotic fruits (I know its not specifically a fruit) became fashionable. The pineapples and mangos etc in Britain are rubbish! Terrible. What are they treating fragile papayas with to make them last the journey from Central America? It is mental that we eat these fruits regularly on this grey island. They are inherently tropical. I don’t expect a good pint of bitter in Costa Rica! Rhubarb however is local, delicious and picked by candlelight. Romantic, red and ravishing (sort of)…..drop the kumquats, support your local rhubarb bunch and eat more crumbles! Expect more rhubarb action soon at the B.H.K. or check out the ‘Rhubarb and Custard Cake’ recipe below.